In honor of A World Apart: Anna Ancher and the Skagen Art Colony, on view through May 12, 2013, we’re researching other delightful, innovative, and interesting Danish women in the arts. Click here to learn more about NMWA’s current exhibition. Click here for Nanna Ditzel: Part 1 of 2! The 1960s were a time of great experimentation for Nanna Ditzel, particular in her choice of media, which included polyester, fiber glass, wicker, cane, teak and foam rubber, as well as her color scheme, which often incorporated vibrant reds and blues, as well as sharply contrasting patterns of black and white. Nanna additionally experimented in split-level floor seating, featuring low-lying chairs and cushions for Danish homes that often featured sunken or raised platforms in their living spaces. 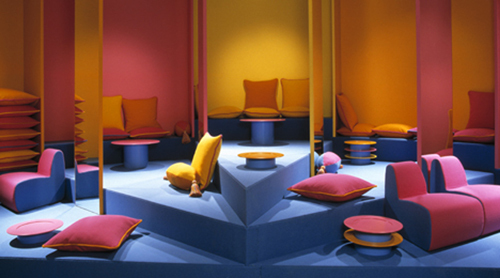 An example of Nanna’s split-level seating experiments is the “stairscape” she created in 1966 for the showroom of the Danish firm Unika-Voev, for whom she designed various textiles. In the realm of textile design, one of Nanna’s most enduring innovations is the simple yet durable 1965 pattern Hallingdal, still produced and distributed by Kvadrat and used widely throughout Denmark. In 1968, Nanna entered into a marriage and artistic partnership with fellow designer Kurt Heide. The couple lived in England together for fifteen years, where they founded the company Interspace International Design Center, a firm specializing in jewelry, textiles and furniture that still enjoys its reputation as a leading international furniture house. After Heide’s death in 1985, Nanna returned to Copenhagen and began working for Fredericia, a leading Danish design manufacturer renowned for its exquisitely made furniture. Two of Nanna’s most popular designs were created during her tenure with Fredericia: Bench for Two (1989)—a sculptural, plywood piece adorned with mesmerizing black and white geometric patterning that won a gold medal in Japan’s 1990 International Furniture Design Competition—as well as her vibrant Butterfly Chair (1990), a dramatic, red and black piece that cleverly evokes inspiration from the natural world. These two designs boosted Fredericia’s reputation as a producer of cutting-edge designs. In the 80s and 90s, Nanna took an active role in the leadership of many Danish art and design organizations. In 1995, she received the “Order of the Dannebrog,” one of the highest honors that can be awarded to a Danish citizen. She was elected Honorable Royal Designer in London in 1996, and received the lifelong Artists’ Grant from the Danish Ministry of Culture in 1998. In 1999, she was awarded the Bindesbøll Medal to honor her contributions to Danish design. Up until her death in 2005 at age 82, Nanna Ditzel continued to design and exhibit her work. 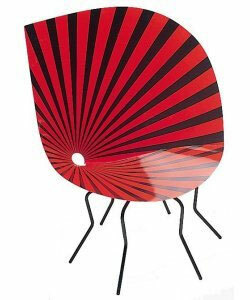 Her furniture, textile and jewelry designs continue to receive international acclaim, and are revered as the work of one of the most inspired Danish cultural icons of the 20th century. —Raphael Fitzgerald is an art historian and researcher.